​Step 1: Plug the first equation into the second. We know that y = 2x - 7, so we can take out the y in the second equation and replace it with 2x - 7. This leaves us with an equation that we can solve for x. Step 2: Plug 3 in for x in one of the original equations. We'll pick the first one. ​Step 3: Go back to the other original equation to check your answer. We used the first equation in the last step, so to check our answer we need to use the second equation. 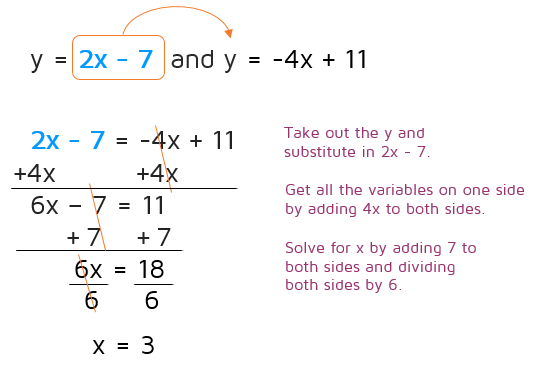 Plug in 3 for x and -1 for y and see if both sides of the equation come out to the same number.